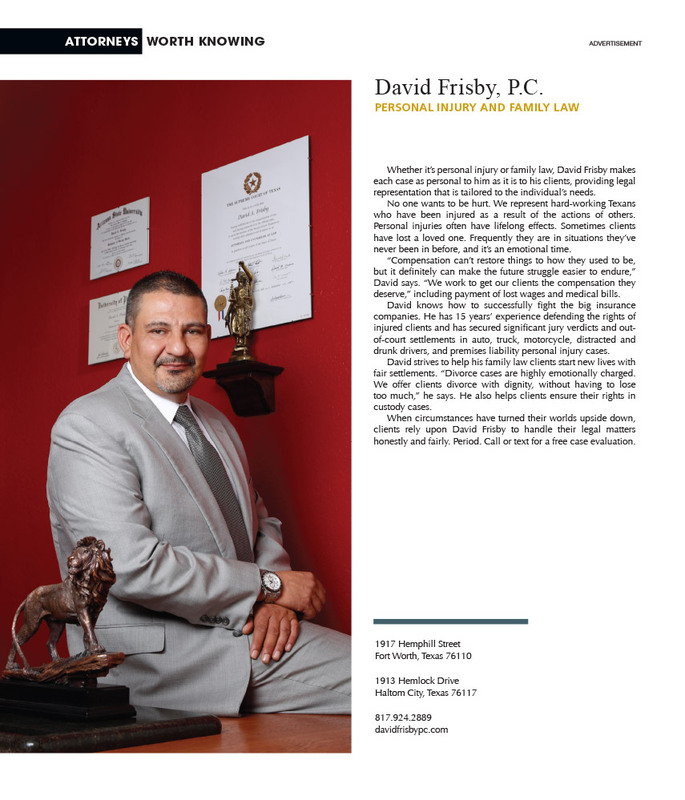 Whether it’s personal injury or family law, David Frisby makes each case as personal to him as it is to his clients, providing legal representation that is tailored to the individual’s needs. No one wants to be hurt. We represent hard-working Texans who have been injured as a result of the actions of others. Personal injuries often have lifelong effects. Sometimes clients have lost a loved one. Frequently they are in situations they’ve never been in before, and it’s an emotional time. “Compensation can’t restore things to how they used to be, but it definitely can make the future struggle easier to endure,” David says. “We work to get our clients the compensation they deserve,” including payment of lost wages and medical bills. David knows how to successfully fight the big insurance companies. He has 15 years’ experience defending the rights of injured clients and has secured significant jury verdicts and out-of-court settlements in auto, truck, motorcycle, distracted and drunk drivers, and premises liability personal injury cases. David strives to help his family law clients start new lives with fair settlements. “Divorce cases are highly emotionally charged. We offer clients divorce with dignity, without having to lose too much,” he says. He also helps clients ensure their rights in custody cases. When circumstances have turned their worlds upside down, clients rely upon David Frisby to handle their legal matters honestly and fairly. Period. Call or text for a free case evaluation.